Today was day one of the tour and I woke up shockingly early as I was so excited to be on a bike tour again. I sorted out the dog, did my final packing, did all the things you need to do to the house when you are leaving it for two weeks (empty the bins etc) and then it was time to go! So Alfie had the Vaude panniers again (for the first time in ages) which were quite heavy. 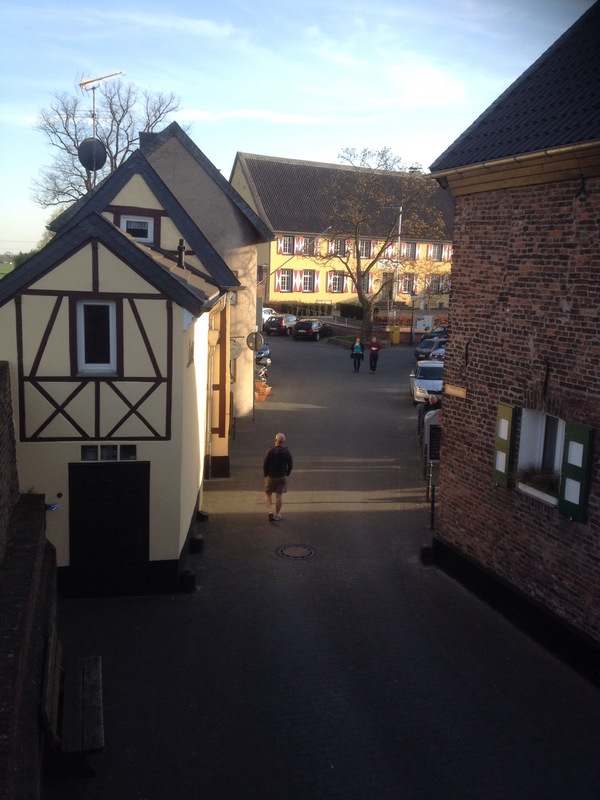 I headed off on the short (5km) journey to Kempen and when I arrived at Hotel Papillon, where Simon & Joyce were staying, Nigel was already there, having ridden over from Herongen (near the border with Venlo). 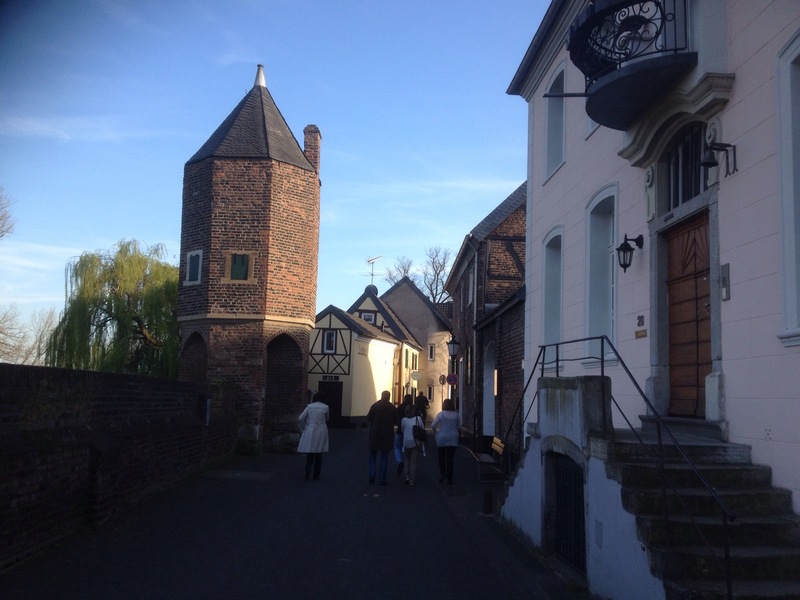 The four of us headed off through Kempen and then south towards Vorst, turning east before Vorst and aiming for our meeting place with Klaus near Neersen. As we were riding through Forstwald we noticed this unusual signpost! We arrived at the meeting place and Klaus rolled up on his trike thirty seconds later. Klaus was introduced to Nigel and then we continued on through Willich. Just past Willich at the Café Streithof (we didn’t go in, but they do very good cakes!) I needed to change the batteries on my Garmin so we all stopped and I took a photo. Look at that blue sky! We rode through Meerbusch and then we joined the Rhine dyke for a short while before crossing the river on the motorway bridge at the A44. There was a nice helter-skelter climb to get up to the bridge – here are Nigel, Simon and Joyce winding their way up. At the top of the bridge we had a good view of the suspension cables. We cycled through the Alstadt, stopping to eat some lunch at the Goldene Ring restaurant. I had Spargelcremesuppe (Cream of Asparagus) and the others had Gulaschsuppe. We then had an Apple Strudel but I forgot to photograph it – shock horror! We then headed further south along the riverside to the Mediahafen area which has some great buildings and an interestined bridge. We stopped on the bridge and a chap on an Anthrotech recumbent trike caught us up and was very chatty (to Klaus, in German). We persuaded him to take a photo of us all. We zoomed down and then continued on the excellent Deich (dyke) cycle path which is wide and smooth. We saw a young chap cycling and talking on his phone and he passed two Ordnungsamt Offiers (they aren’t police but perhaps a bit more like PCSOs) and they told him to get off the phone. It was pretty warm now – 19 degrees or so – and so it was time for more suntan cream. 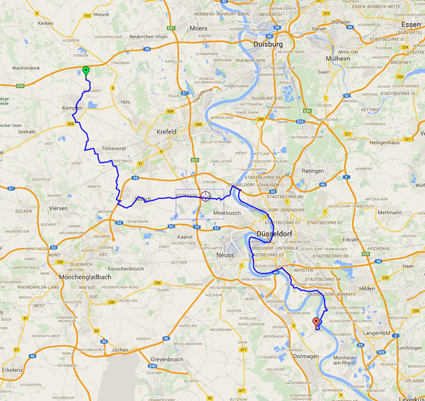 We headed on further, through the Bilk area of Düsseldorf where I lived for a month in 2010. The Brits were all flying Union Jacks – here is Nigel’s (although it is the wrong way round). 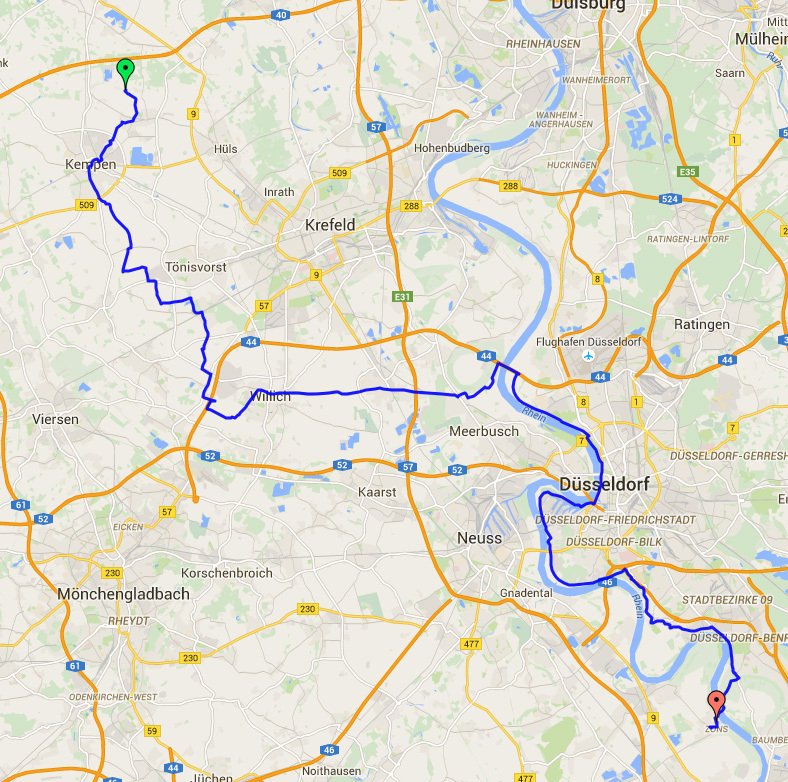 The plan was to stay on the right hand side of the Rhine and cross using the ferry to Zons. We had a bit of a ride through some uninteresting ribbon developments south of Düsseldorf but at one point an Englishman waiting with his bike at a bus stop saw us, hopped on the bike and rode with us, chatting with Simon. We passed a McDonalds and Joyce wanted to use their loo. Klaus and I couldn’t resist a McFlurry each. It was just another 5km to the ferry to Zons – and it was Klaus’s first opportunity on this tour to dip his toes in the Rhine, his river. Here we are on the ferry. I travelled on this several times in 2010. Crossing price was 1,50€ each (this was a ticket for two). The hotel was apparently, according to the Garmin track, just 800 metres away but we actually overshot it as the Garmin track went a bit further than the hotel. We soon found it, though, and the owners let us in. There was nowhere very secure to park the trikes so we locked them all to each other – moving a block of four trikes would be difficult! Nigel had cycled a few km up the road to a campsite and will meet us here tomorrow morning. After a shower and writing up this blog it was time to head out for some food. Zons is a lovely little town with lots of old gates and walls. 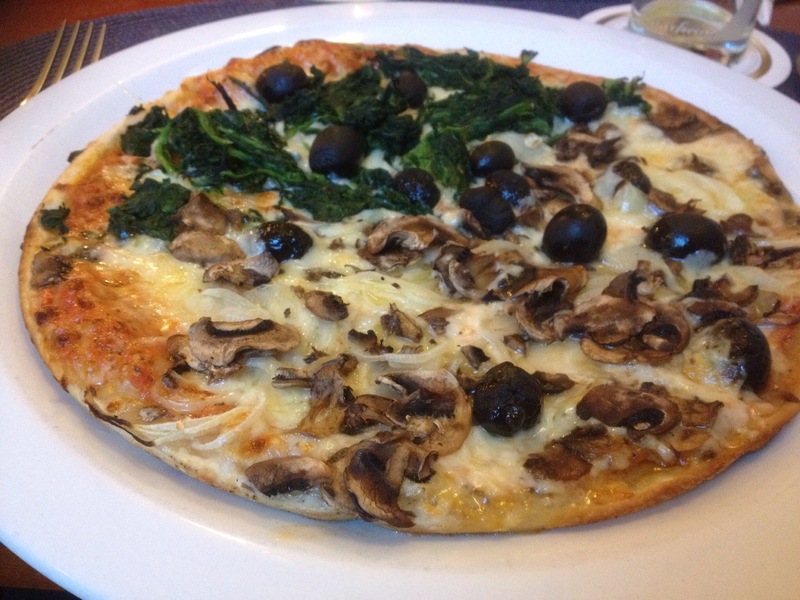 We found a pizzeria which did nice food although rather slow service! Still it was good to have a hearty meal after our 73km ride. Well done Helen, on so much photo blog while you are out on the road! The temperature has plummeted here with cold north-easterlies over the weekend, so I am slightly jealous of your weather and ride. Say hello to Nigel — I believe it was him we met on the Great Baltic Sea Ride last summer, a few miles south of Neman river in Lithuania. We chatted for a bit before riding on. Good to see him on tour again.